Sweet Tomatoes Creamy Herbed Turkey Soup is a seasonal favorite at this spectacular salad bar restaurant. Why do so many people love Sweet Tomatoes? High quality ingredients, everything is freshly made, and they make food from scratch. What is not to love? The only drawback at Sweet Tomatoes is sometimes your favorites aren’t being served. I have had this recipe requested so many times, but those requests came in January, and not during the month where I could taste the soup. So this year I set my calendar and made it to Sweet Tomatoes to check out your soup. 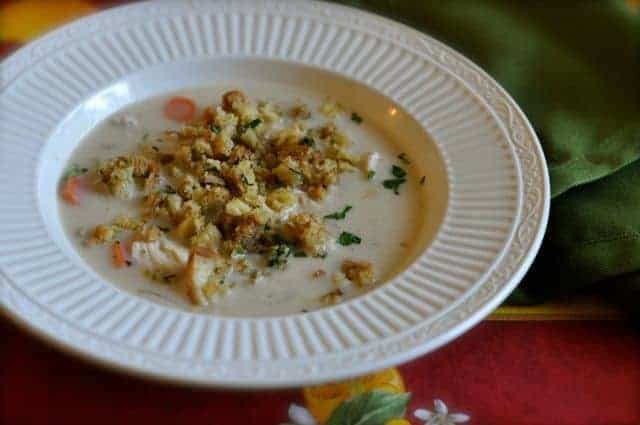 This is a creamy soup made with turkey, onions, celery, carrots, and topped with stuffing. They make theirs homemade and fresh, for this recipe I am going to use a box of dressing mix. I think the boxed variety works quite well, and if you are making this after the holiday, perhaps you have some of your own homemade stuffing you can serve. IF you do not have any turkey, you could purchases some turkey at the deli counter. If not, chicken will work just fine in this soup. For Turkey stock you may want to use some Turkey soup base. Soup bases are sold next soup stocks in most grocery stores. No one makes better left over turkey soup than Sweet Tomatoes! In a medium-sized pot add 4 cups of water and celery and carrots. Cook for approximately 10 – 12 minutes over a medium-high heat. Drain carrots and celery and set aside. Start soup by making the roux, you will need to melt 1/2 cup butter in a large stockpot over medium heat. Add onions to the melted butter, and cook onions until they are transparent. When onions are transparent add 3/4 cup of flour. Reduce heat to a medium-low heat and cook flour mixture for 1 to 2 minutes. The color should darken and this roux should smell like cooked pie crust. Turn heat up to a medium heat, and add 1 cup of turkey stock to mixture. Stir until thickened. Add another cup of turkey stock to flour mixture, stir until thickened. You may need to raise the heat just slightly to ensure rapid thickening. Add half of remaining stock, stir until thickened, and then add the remaining turkey stock. Add turkey, cooked celery and carrots, poultry seasoning, salt, pepper, and parsley. Stir until well mixed. Add 2 cups of heavy cream, and cook for an additional 10 – 15 minutes on medium-low heat. Cook stuffing according to package directions. When you are ready to serve, ladle soup into a bowl and top with cooked stuffing. I made this recipe with homemade turkey stock from our Thanksgiving turkey and it was amazing! It actually tasted even better than Sweet Tomatoes with my homemade stuffing! We will be making this again very soon! I love this soup. It is everything I love about Thanksgiving in a soup. Turkey soup also has cranberrys and sweet potatoes in it that is why it tastes like turkey dinner in a soup. This is the best soup I’ve ever tasted! You must try it. Sweet Tomatoes makes it fresh during December. There is nothing like it. I could taste every ingredient. And the herbs are outstanding. I really like this soup. It is one of my favorites. There is just something about turkey soup that is so comforting no matter what temperature it is. I really think turkey is so under utilized. It has so much more flavor than chicken.